White Boy Rick is a 2018 Crime Drama movie directed by . It stars Richie Merritt, Matthew McConaughey, Jennifer Jason Leigh, among others. 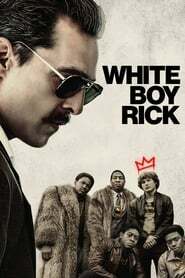 White Boy Rick is currently rated 6.3 stars on the ReelBugs scale. Grew up in the D. His crew had a video store in my neighborhood when I was a kid. Pops sent me to get a movie. Dude behind the counter wasn't paying attention and gave me the wrong movie case. I get home I'm like pops why is there white stuff in this case. 😁 Pops closes the case we walk back to video store pops hands dude the case like "you gave the wrong movie to my son" dude was like Sorry get any movies you want free" long story true story! You know what’s funny about this movie? They didn’t need to build a set of Detroit. They could film real life Detroit and it looks the same! If I was rick I’ll be suing the FBI for endangering a minor life because FBI didn’t give a fck abo Rick life he was about 15 or 16 doing the same job as a FBI agent.. Let that man out of prison he did his time..
Lol he looks like ohgeesy from shoreline mafia. The trailer is very misleading from the actual movie. If you are from the D, then you know about young boys incorporated, and the Chambers brothers. Rick got famously for being a white boy. Two things got me hyped for this movie. 1. "Based on a true story"
The actual movie is missing scenes from what they are previewing in this. Wtf!!!! I donno if this is gonna be a good movie or not. But this is one kickass trailer. Rick looks like ohgeesy from shoreline mafia anyone agree or is it just me? They Did him Dirty and he was only 14. Rick:what u all have em. WBR wasn't even moving any major weight. Y.B.I., Chambers brothers, Pony Down all were pushing way more than him. Maserati Rick was killing them too. WBR is in prison not because of drugs. He is in prison because he had the drop on major politicians and Cops. He even had some knowledge on State police, Marshalls and Toledo cops. That's why he got nabbed. If it was only for the drugs he was pushing, he would have only did about 5-8. He was small time as far as the drugs were concerned. Dexter and Davidson - Those who know, know! T.$tones - Y.B.I. Never trust 5 O..... It better be in writing and signed off by an attorney!!! Yessss finally I can't wait. I play a nurse in the movie in an important part. I waited over a year to see myself yet again in another good movie. Cmon September!!! Just watched this movie and read at the end he did more time then the dirty cops and that crew he was friends with that’s just sad..him helping lock up politicians, mayor and cops probably why he is still there sadly. Detroit is really slowly turning into the step-child of HOLLYWOOD!!! I grew up in Detroit. 80s baby. Im not white, but random school kids used to call me White Boy Rick... but I never who he was or about him. Cant wait to eventually see this movie!